In 1978, two tortured corpses were discovered in the sea off Guatemala. Hooded, bound with ropes and weighted down with heavy engine parts, Chris Farmer and his girlfriend Peta Frampton were still clinging to life when they were thrown from a yacht on which they had been crewing. 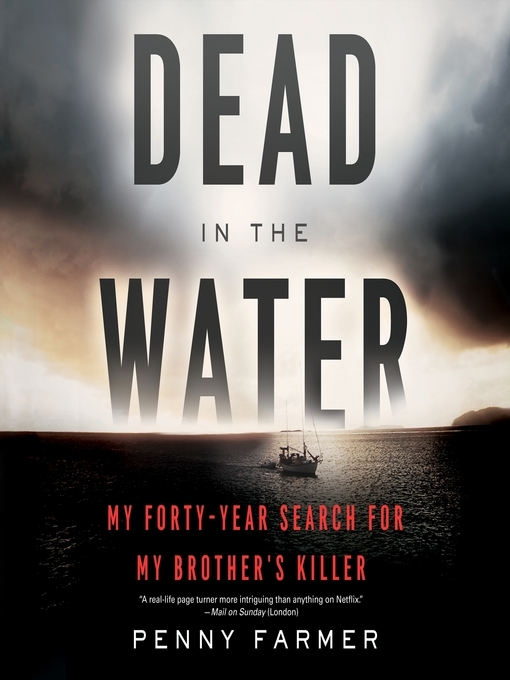 This is the gripping account of how Chris's family painstakingly gathered evidence against the boat's Californian skipper, Silas Duane Boston, working alongside the FBI, Interpol, and police in the UK and the USA. Almost four decades later in 2015, there was a major breakthrough in the case when, using Facebook, Chris's sister Penny tracked Boston down. Following the testimony of his two sons who, as young boys, had witnessed the horrific murder of Chris and Peta at the hands of their father, Boston was finally arrested and charged with two counts of maritime murder. Chillingly, Boston was later linked to several other killings on US soil-at one point he was even the FBI's prime suspect in the notorious Golden State Killer case, until DNA ruled him out. The list of crimes for which he was suspected put him in the league of America's most prolific and elusive serial killers. Not just a story of murder on the high seas, Dead in the Water is a tale that offers insights into the minds of the killer and his two sons. And it reveals a family's fortitude and diligence in tracking down a monster of a man, a task which ultimately fell to the author to complete. It exemplifies that life can be senselessly snuffed out but love never dies.